New York, Routledge, 2016, 350 p.
This work on the “Paradoxes of Post-Mao Rural Reform” constitutes another masterstroke by Warren Sun and Frederick Teiwes in the Chinese studies arena. As the authors themselves pointedly note, foreign observers have had the misguided tendency to swallow the Chinese Communist Party shibboleth that depicts the reform process as a relatively linear and consensual process and assigns all credit for the success of economic reforms to Deng Xiaoping following a so-called ideological and political struggle against the Hua Guofeng-led neo-Maoist clan. Sun and Teiwes astutely show that while the Beijing elites went along with the rejection of the Mao regime’s inherent instability, they all shared – Deng included – an attachment to the collectivist system. Backed by solid arguments and multiple sources, the authors also establish that while these elites were divided over how to go about improving the lot of the poorest peasants, it was above all Hua Guofeng, who with his long experience in farming policy in Hunan and at the prefectural (Xiangtan) and provincial levels, displayed pragmatism and tolerance by accepting attempts towards family farming and dialogue with provincial cadres. Thus, by authorising practices carried on earlier in secret or with local authorities’ tacit agreement, it was under Hua, not Deng, that a certain liberalisation of the agricultural market began, eventually helping to free enough capital for investing in industry and unleashing the Chinese economy. Melbourne-based Warren Sun is associate professor of Chinese studies at Monash University. Frederick Teiwes is emeritus professor of Chinese politics at the University of Sydney. While they have been published separately, the two have worked together and produced many major publications since the mid-1990s: The Politics of Agricultural Cooperativization in China: Mao, Deng Zihui, and the “High Tide” of 1955 (1993), The Tragedy of Lin Biao: Riding the Tiger during the Cultural Revolution, 1966–1971 (1996), China’s Road to Disaster: Mao, Central Politicians, and Provincial Leaders in the Unfolding of the Great Leap Forward, 1955–1959 (1999), and The End of the Maoist Era: Chinese Politics During the Twilight of the Cultural Revolution, 1972–1976 (2007). While the Australian duo are known for conscientious analyses of the Chinese decision-making process and power struggles in the CCP’s highest echelons, they have also been interested in issues relating to the country’s agriculture and economic development policies. Having covered the tumultuous Cultural Revolution period in their previous works, Sun and Teiwes have over the past several years been engaged in studying the transitory Demaoisation period (1977-1981), with its pronounced economic and political reorientation. Many points in the book stand out: first and foremost, Hua’s undeniable influence in the agriculture sector. As “supreme leader,” it was he who decided to jail Maoists in October 1976 and to call the first major conference on agricultural issues in December that year. From then on, he allowed experimentations in the most desolate regions. His prioritisation of agricultural problems was reiterated until the Third Plenum of the 11th Central Committee of the CCP (December 1978), which among other things discussed allocations for agriculture. Interestingly, this policy’s main aim was, according to the authors, to safeguard the state, and it was applied with no well-defined outcome in mind. As Zhao Ziyang noted, its positive results came as a real surprise: clear augmentation of farmers’ living standards came side-by-side with a rise in farm yields, which helped restructure the rest of the economy from 1984 onwards. Second, while works on the period essentially showcase Hua’s “inefficiency” or “leftism” and the rupture that Deng’s ascent to power represented, Sun and Teiwes attempt to show the continuities in their complexity. For different reasons, Hua and Deng shared some characteristics (pragmatism, hankering for stability, and belief in socialist collectivism). But Deng had no experience or acquaintance with rural reforms, whereas Hua had been much engaged in this field in Hunan and had been asked by Mao in 1975 to organise the first Dazhai conference. Accordingly, Deng made only three vague commentaries on the agriculture during this period. The authors explain that after Deng took power, he merely “followed the movement” Hua had inspired and let his protégés better versed in the domain – Wan Li, Hu Yaobang, Zhao Ziyang – take the reforms forward. Without denying Deng’s qualities, Sun and Teiwes show that the two leaders demonstrated enough flexibility for new ideas to be implemented and integrated in national policies. Far from being a stride towards clarity, it remained a period of questioning, debate, and adjustment. Finally, in one of their key points, the authors entirely refute the thesis of a politico-ideological struggle between a radical Hua and reformer Deng. On farming matters, they found no proof of dissension between the two leaders. The authors prefer to think that Deng’s rise to power resulted from a failure on the part of elite Communists to recognise Hua as one of their own as they favoured the “old revolutionary” Deng. Of course, Deng was one of the major political and military figures of the revolution that ushered in the People’s Republic and one of the top-ranking leaders before 1966, while Hua, 17 years his junior, only joined the Party in 1938 and made it to its “centre” as late as 1971 at Mao’s behest. This subject is alas not exhaustively dealt with, as the authors are in the throes of writing another book on the same period specifically addressing the political problems head-on. Given the scale of the work undertaken and the major contribution the book represents, it is difficult to pick out negative points. That being said, its arguments would have gained weight with the addition of more figures and statistics on agriculture in the period considered. Moreover, to the extent that the authors insist on continuity between Hua and Deng, it would have been useful if, in the introduction and subsequent chapters, they had given a pre- and post-Mao account of the economy and agriculture. While Sun and Teiwes point out some ruptures and continuities between the two regimes, one is left wondering about the impact of Mao’s death and the suppression of the “Gang of Four” on agricultural policies. This dense and complex book is certain to interest all historians of modern and contemporary China. Sun and Teiwes bring out Communist China’s complexity and prove once again that it is possible to write historically on the subject of Chinese political elites. Alexandre de Saint-Denis is a PhD candidate at the Institut National des Langues et Civilisations Orientales (INALCO), Paris (alexdesaintdenis@gmail.com). Apart from the above-mentioned The Politics of Agricultural Cooperativization in China (1993), Sun and Teiwes have written extensively on these issues. Notable are for instance: Warren SUN and Frederick C. TEIWES. 2011. “China’s New Economic Policy Under Hua Guofeng: Party Consensus and Party Myths.” The China Journal 66: 1-23; Warren SUN and Frederick C. TEIWES. 2013. “China’s Economic Reorientation After the Third Plenum: Conflict Surrounding ‘Chen Yun’s’ Readjustment Program, 1979–80.” The China Journal 70: 163–87. Kerry BROWN. 2017. 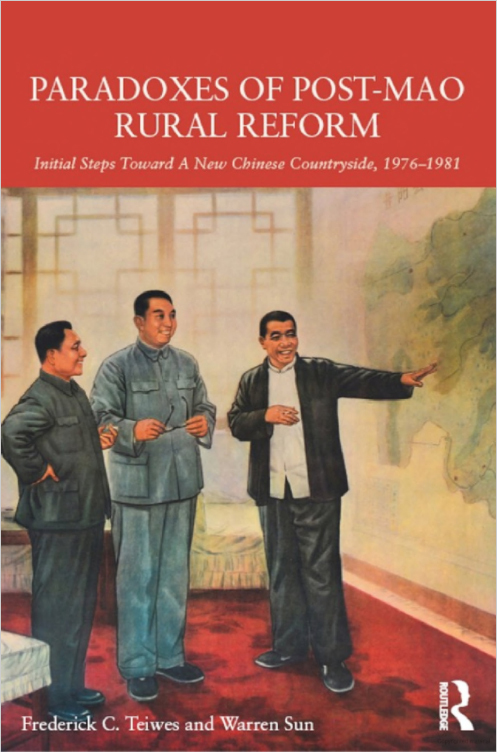 “Paradoxes of Post-Mao Rural Reform: Initial Steps Toward a New Chinese Countryside, 1976-1981.” Journal of the Oriental Society of Australia 48: 211-214. Frederick C. TEIWES and Warren SUN. (Forthcoming). From Restoration Toward Reform: Hua Guofeng, Deng Xiaoping and the Dismantling of Maoism, 1976–1981.